Achieve your greatest level of independence with our installation of home elevators, stair lifts, and more! Neck and back conditions often create significant barriers to quality of life, yet there are answers. Live In Place not only understands these conditions but also has been able to help many families remain in their homes in familiar surroundings, with independence and mobility. 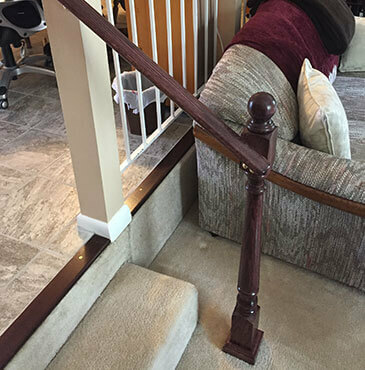 Back and neck conditions often require modifications in many areas of the home. Live In Place determines what modifications are needed to get out of bed, use the bathroom, move around the home, use the kitchen – all the while avoiding the bending and twisting that cause pain and risk of falling. We assess the home for spinal joint protection and the prevention of inflammation. Live In Place home modifications will be completed as needed to help ensure your ability to minimize pain, continue to do the tasks you desire and achieve your greatest level of independence. Call us today at (703) 433-0380 or request a consultation and let’s ensure your continued independence in your own home. Let’s discuss your unique circumstances and see how we can assist you.